Naval Gunnery Target Balloons (NavTGTs) are required by marine, navy and coast guard units to maintain a state of readiness in target acquisition and gunnery skills. Surface targets made from vinyl film, are relatively light weight, easily stored due to small deflated size, easily inflated from any powered air blower, and deployed by just a few personnel. Airbourne targets made from polyurethane material in a variety of colors are easily inflated with buoyant gases readily available. RADAR reflective NavTGTs utilize a rigid corner reflector with laminated metal foil material intended to simulate a small craft on electronic systems. This allows radar system operators to lock onto their target to ascertain range and azimuth information for use by commanders to initiate simulated combat, interdiction, or rescue missions. Special technical enhancements or modifications such as strobe lights, IR strobes, internal lights, high reflective specialty tape or other enhancement devices are available at additional cost. 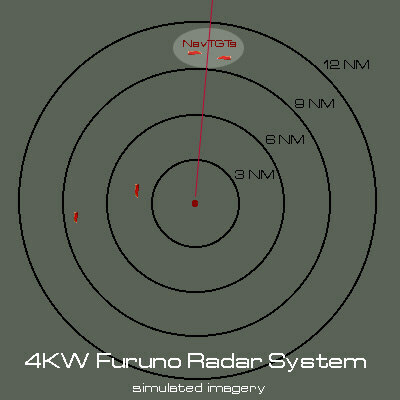 Existing targets are in use with the US Navy, US Coast Guard, Canadian Navy, Nato nations, Royal Malaysian Navy, New Zealand Navy and other military forces worldwide. Naval Gunnery Target Balloons are freely exportable from the USA without restrictions. Most NavTGTs available via Defense Logistics Agency (DLA). All NavTGTs available direct from GeoData by "Open Purchase", including "RUSH" delivery via Federal Express or FPO/APO for smaller NavTGTs. We accept Visa/MC purchase cards and deliver direct to individual commands. NavTGTs cataloged in Shepard Military Training and Simulation handbooks, Navy Cherry Point Range Complex Final EIS/OEIS, and other military reference sources. 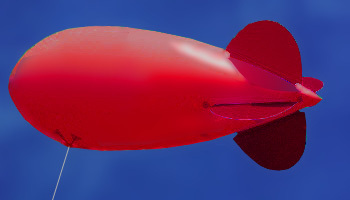 Very Small Active Tumbling Adrift Navy Gunnery Target Balloon designed use as multiple targets adrift, tumbling, blowing, and bouncing airbourne in light or moderate seas. May be used with optional IR or White strobe lights inside target. May be inflated and launched from an airbourne helicopter door. Target Balloon measures 0.75 meters³ (2.5 x 2.5 x 2.5 feet). It is made from heavy duty, rugged and durable day glow Lime GREEN 12-mil PVC vinyl film. 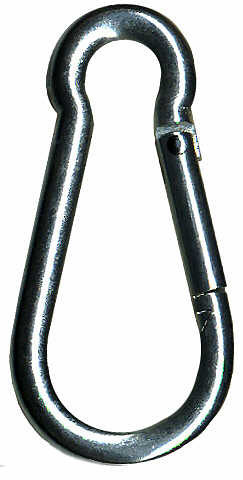 Screw tight 2-inch inflation Nozzle Cap, Carabiner mounted for easy handling. Handling line NOT INCLUDED (considered dangerous for helocopter launch) *. 4½-inch diameter heavy duty cardboard shipping tube with easy open end cap free of exposed staples. Visual only. NOT Radar reflective. 3-ft ¼-inch polypropylene handling line included *. Add some water inside for stability and to control rate of active tumble in waves if desired. May also be used partially flooded as sea anchor tether for Bogie Blimp™. Killer Kiwi™ NavTGT Instruction Sheet. Active Tumbling Adrift Navy Gunnery Target Balloon designed use as multiple targets adrift, tumbling, blowing, and bouncing airbourne in light or moderate seas. Add some water inside for stability and to control rate of active tumble in waves, if desired. May be used with optional IR or White strobe lights inside target. Target Balloon measures 1.5 meters³ (5 x 5 x 5 feet). It is made from heavy duty, rugged and durable Bright YELLOW 12-mil PVC vinyl film. Screw tight inflation Nozzle Cap with one-way chute inside to prevent back flow, Carabiners (versus D-rings) for easy "clip-on" of handling lines, 6½-inch diameter heavy duty cardboard shipping tube with easy open end cap free of exposed staples. Visual only. NOT Radar reflective. May also be used partially flooded as sea anchor tether for Bogie Blimp™. Killer Lemon™ NavTGT Instruction Sheet (83Kb). Killer Orange™ NavTGT Instruction Sheet (83Kb). Adrift Navy Gunnery Target Balloon designed to be set adrift in light or moderate seas. Large submerged base floods for stability. High RADAR visibility, high survivability under fire, compact storage, easy inflation and launch. "X" marks the spot. Target Balloon measures 3 meters high and 3 meters wide (10 feet high x 10 x 10 feet diagonal), made from heavy duty, rugged and durable Bright YELLOW 12-mil PVC vinyl film. Adrift target includes a tall buoyant superstructure with a large submerged base which floods with water for stability in wave action. 50-ft handling line attached to the base enables target to be righted upon deployment or tipped and drained of water during recovery. Minimum structure above water increases survivability, except for a direct hit. Height of RADAR reflector above sea surface provides excellent visibility at distance (estimate ±9-12NM visibility moderate sea states). 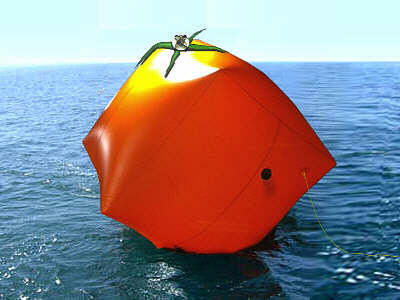 More easily inflated and deployed than Killer Tomato™, with similar (12m²RCS) RADAR reflectance. Corner Reflector mounted atop. May be used with optional IR or White strobe lights on outside of target. At target base, screw tight Nozzle Caps on each leg with backflow prevention flap to restrict leakage during inflation, Carabiners (versus D-rings) for easy "clip-on" of handling lines, 13-inch diameter heavy duty cardboard shipping tube with easy open end cap free of exposed staples. External rigid RADAR corner reflector a top target. 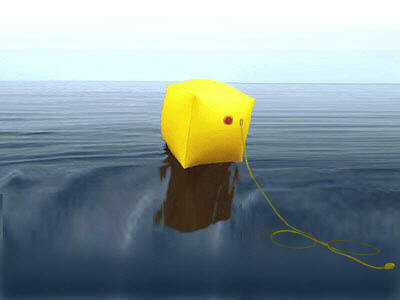 (estimate 12m²RCS, ±9-12NM visibility moderate sea states). Adrift Navy Gunnery Target Balloon is improved design with ring shaped flat bottom & three section flooded skirt to stabilize target with minimal roll, wobble or bobbing in moderate seas. Hard RADAR corner reflector is fastened to secure carabiner fastener a top NavTGT for maximum range detection and visual confirmation that reflector is functional. May be used with optional IR or White strobe lights inside target. 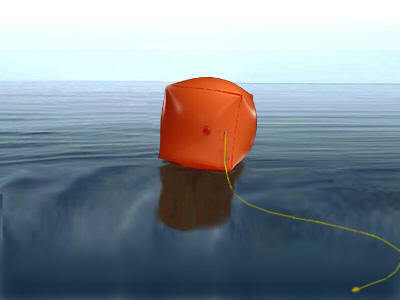 Target balloon measures 3 meter³ (17x17x15 feet) and is made from International Orange 12-mil PVC vinyl film. 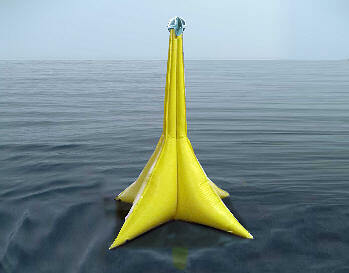 Large vastly improved sea anchor "Skirt" to hold the NavTGT to the surface with less wobble & bobbing. Screw tight inflation Nozzle Cap with one-way chute inside to prevent back flow, Carabiners (versus D-rings) for easy "clip-on" of handling lines and RADAR target, a new rigid RADAR Corner Reflector attachment at the very TOP of the now diagonally oriented NavTGT for best max range visibility (expect 10-15 miles in nominal sea states), 13-inch diameter heavy duty cardboard shipping tube with easy open end cap free of exposed staples. Green "leaf" decoration a top NavTGT enhance appearance as an actual Killer Tomato™ NavTGT and clearly indcates the location to fasten the RADAR corner reflector. Requires large deck area to inflate and deploy. (12m²RCS, ±10-15NM visibility moderate sea states). Towed Navy Gunnery Target Balloon is designed to be towed in light seas at a speed of 10 knots (up to 20 knots max in ideal conditions). Target Balloon measures 6.7 meters in length (22 long x 10 wide x 8½ feet high) and is made from heavy duty, rugged and durable Bright YELLOW 12-mil PVC vinyl film. Towed target has a V-shaped multi-layer PVC+nylon keel with a hardened Tow Loop fastener in front; heavy duty tow cable is not included. Dual chamber hull and target pillows are easily inflated into shape for use. After deployment over the side, space between hull tubes is flooded to provide water ballast to keep target upright. Any excess water gained during use overflows a short inflated transom at the rear. Optional use "water pillow" in bottom of target panel may be filled with water for extra "contained" ballast if desired. 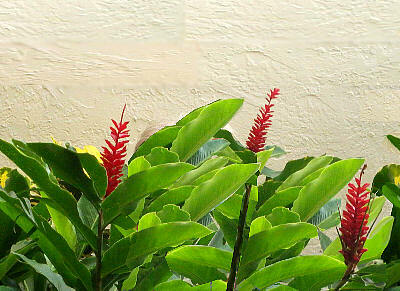 Corner Reflector mounted a top (12m²RCS). (3) carabiner fasteners mounted to target panel axis for easy attachment of special equipment, lights or other gear. May be used with optional IR or White strobe lights inside any individual air chambers. Screw tight inflation Nozzle Caps, Carabiners (versus D-rings) for easy "clip-on" of handling lines, 13-inch diameter heavy duty cardboard shipping tube with easy open end cap free of exposed staples. Inflates with approximately 315 cu. ft. of air. Killer Banana™ NavTGT Instruction Sheet (92Kb) . 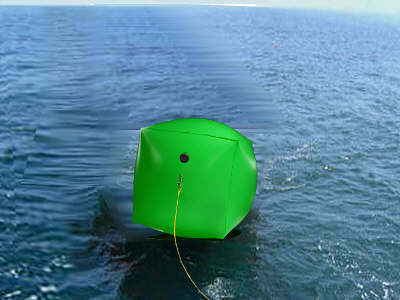 Tethered Airbourne Gunnery Target Balloon is designed to be filled with helium (He) or hydrogen (H²)† and tethered to a surface anchor (see Killer Kiwi™, Killer Lemon™ above) or towed from the surface in light seas at a speed of up to 25 knots (gusts to 45 knots). Blimps from 3 to 9 meters long, made from very strong, light weight polyurethane. Target has a hardened tow loop on bottom to which to fasten tow line. Gas fill hose and 200 Lb test 135-ft tether line (included). Visual only. NOT Radar reflective. For RADAR use optional Radar Corner Reflector (below). See specifications in table below for further information. Actual Lift varies by temperature, barometric pressure, altitude & gas used (He,H²). † Hydrogen (H²) is highly flammable and hazardous. Helium (He) is non-flammable, non-toxic and safe to use. or FedEx Ground to shore facilities within USA. Shipping cost is determined at time of Order when exact delivery address, type and level of service is chosen. WARNING: Tow Line under tension is dangerous, whip back of a broken line can cause serious injury or death. Ensure personnel are trained in safety procedures before towing. All prices in US$. Plus shipping and applicable taxes, duties or tariffs. Prices listed are GSA equivalent. All sales are direct to end user or government authorized entities. Resale is prohibited. NavTGT names Killer Kiwi™, Killer Lemon™, Killer Orange™, Killer Banana™, Target X-Ray™ & Bogie Blimp™ are trademarks (™) of GeoData Systems Management Inc. In addition, GeoData has been using Killer Tomato™ in the marketplace since 2004. No registration of the term Killer Tomato™ is implied or claimed with respect to target balloons. GeoData Systems Management Inc. (GeoData) sells NavTGTs direct to business, military & government end users. GeoData NavTGTs are NOT SOLD to any third party organization for Resale. 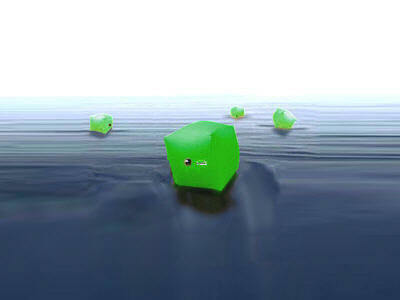 GeoData is the designer, manufacturer and provider of these NavTGTs. Prices are as posted, plus shipping, insurance & handling, not including any applicable taxes, duties or tariffs (usually exempt to government users). Orders may be placed direct by business end users, military commands, procurement personnel, duly contracted government agents, or national embassy personnel and/or Liaison Officers in Washington, DC. See NSN's for purchase via DLA.